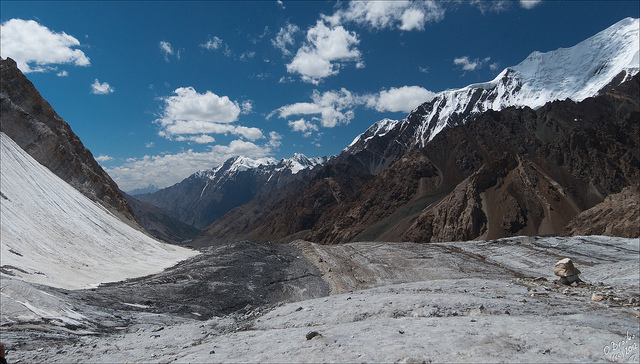 The Tian Shan Mountains in Kyrgyzstan house multiple gold mines that are now posing a threat to the nearby glaciers by speeding up their melting. The Kumtor open pit gold mine, one of the biggest in Kyrgyzstan, may be at the centre of a disaster waiting to happen. The glacier melt in Kumtor is on the rise, increasing the threat of overrunning into a tailings pond nearby. The increasing melt is putting pressure on the natural dam and may lead to a glacial lake outburst flood. The speed of glacier melting is only accelerated by the dumping of waste rock. An outburst may result in mixing of the melt with the tailings pond. This will release cyanide and other toxic waste into the country’s river system, in turn affecting agriculture, a sector that employs one-third of the country’s population. Kumtor slices through two glaciers (Lysyi and Davidov) and is partly owned by the government and is one of the biggest open pit gold mines in the region. The condition of Central Asian glaciers has been highlighted in a research published in Nature Geoscience Journal that says one fourth of the glacial mass has melted in last 50 years, a rate alarmingly higher than the global average. Agency IRIN News has reported that environment consultation firm AMEC Earth and Environmental UK Ltd had been commissioned to assess the risk and make recommendations. In its 2013 audit, AMEC recommended hiring an engineering company to suggest and implement options to lower the water level of the glacial lake. However, no such action was taken. The company claims that it has been implementing measures to manage glaciers and ice since the beginning of the project in 1994. Kyrgyzstan’s latest submission to the UN Framework Convention on Climate Change estimated that the country would lose 94 per cent of its glaciers by the end of the century. This exclaims the urgency of taking measures to protect the region.